I went outside early with my camera and was able to find a cicada willing to pose for me. Isn't he handsome? He thinks he is. Too bad I can't record how LOUD he is. Every time I walk outside I pass a million little things to do. Each one tries to get my attention...me, me, look at me! 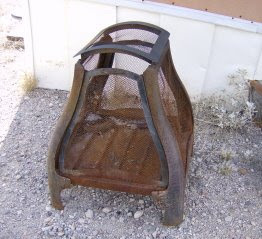 (ok, I don't really hear voices) This old fire pit that came from the the Bad Renters was rusting away next to my mobile home. I didn't really want to move it in to the garage because I will forget about it. 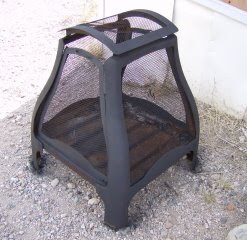 I bought a can of BBQ high heat Rustoleum paint a few months ago with this fire pit in mind. Finally all of the stars aligned and I had the time, shade, tools, and right wind conditions for the project. I scrubbed it with a wire brush and sprayed it with paint. It still needs a little bit of work on the inside but this is a good start. I want to put bricks under it's feet so that they don't sit on the wet ground and put a trash bag over it when it starts raining again. Some day I will have a covered patio for it to sit under or maybe I will just give it away. For now I have a cool fire pit to play with! 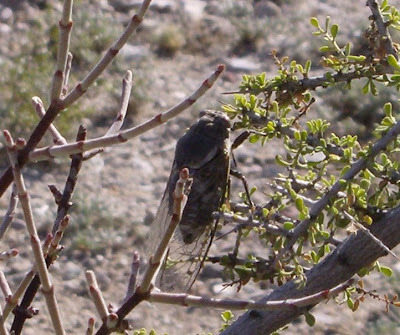 The last big Cicada hatching I remember over here was when I lived in Nashville, so 1998. They were everywhere for a couple of weeks. I remember being at Kroger and seeing a man pick one up and throw it down the aisle at his wife. She screamed and ran which he thought was just hilarious. Uhoh, if they are 13 year cicadas they will be back in 2 years! Run! How often do 13 and 18 year cicadas coincide? Those must be reaaly swarmy seasons. KoBold, I haven't heard of them coinciding. One lives in the northern states and one lives in the south. I suppose it could happen in those unfortunate middle states.